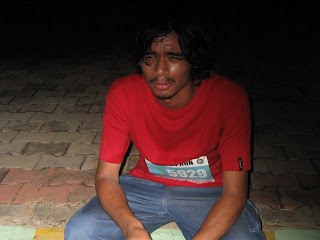 I had planned to do my penultimate long run before SCMM 2012 at the Midnight marathon 2011 on 11th December. I registered for the half-marathon again just as I have done the last two years. Rahul and I went to the KTPO parking lot in Whitefield and collected the bibs around 1030am on 10th morning. Preparations were underway for the event with the various banners going up. My goal was to do 32Km in just under 3 hours at an average of 5:37 per Km. This meant doing at least 7 and not more than 8 loops of 4.2Km each. After a busy morning I rested most of the afternoon. Rahul and I left home 7PM to pick up my Dream A Dream mentee David and his friend Mahesh. This took some time as they were waiting at a bus stop in IRR instead of at the Domlur bus stop on old airport road. After seeing one of the posts on my runs on Facebook, David informed me that he had started running and wanted to run in an event. He readily took the opportunity to run 5Km at the Midnight marathon. His friend Mahesh who had come with him for company decided on the way to Whitefield that he would also like to run. Fortunately there was an extra 5Km bib available which I was planning to use. At Brookefield we picked up Abhi (my brother's son) and reached the parking area in Whitefield by 745PM. The parking area was huge with volunteers directing vehicles. 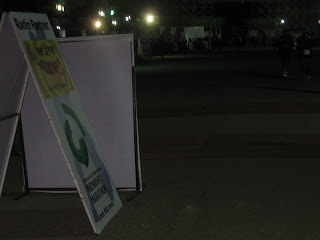 It was 5 minutes walk from the parking area to the holding area where there were a few food stalls. Also, there was a stage where a band was playing live music and announcements were being made. We took a few pictures here. The 5Km event was flagged off at 830PM. David and Mahesh took off very fast. 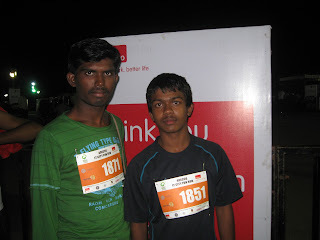 I ran the first loop of 2.5Km with Abhi who ran a pretty steady pace. I then waited on the course and ran the last 100m of the second loop with Abhi who finished his 1st 5Km in a very creditable under 35 minutes!! David and Mahesh seemed to have run their 5Km very quickly and ended up doing a 3rd loop for a total of 7.5Km in under 30 minutes!! 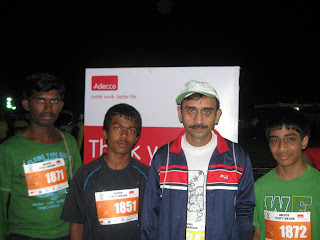 At the end of it they felt they should have run 10Km - I told them they could do that at the TCS 10K in June 2012. Mahesh, David and myself ate a Dosai each - after which I dropped them and Abhi at Brookefield. I was able to come back and park my car easily at 10PM - just as the 10Km event kicked off. I waited patiently at the turn around point to try and shoot Rahul in action. Though I saw him in each of his loops I was not quick enough to take pictures. There were quite a few other runners standing at the turn around point and it so happened that just before Rahul came by I got distracted by conversation with one or the other runner friend. I did manage to take a photo of the Ethiopian who finished first in men's 10K in about 32 minutes and a few of Rahul when he was quite exhausted at the end of his run. He finished in a very reasonable time of 1:07:46 considering that he had not done even a training run since the TCS 10K in June 2011. 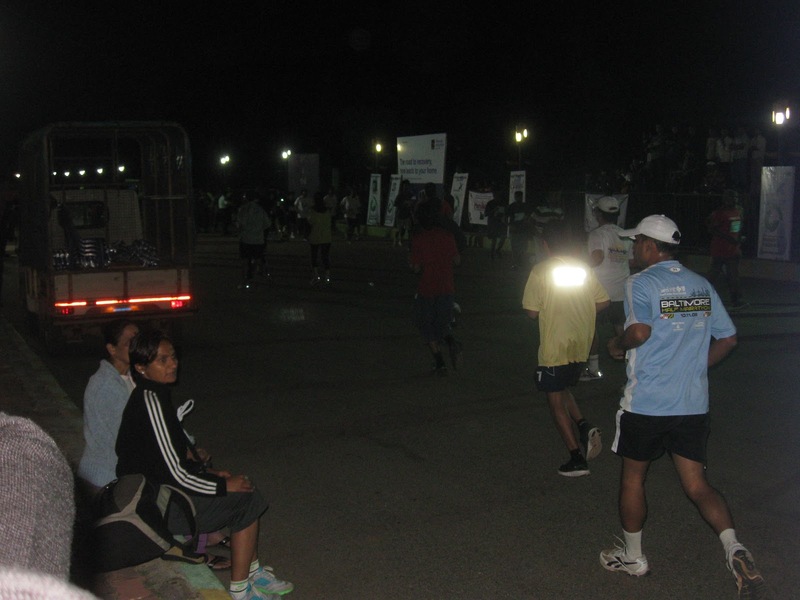 The HM and FM was flagged off at midnight - there seemed to be a few hundred runners. We had to do an out and back loop of 4.2Km , that is 2.1Km out and back. The route had several turns - however overall I liked it better than the route of the previous years. The road was wider and the divider was broad enough for the traffic on the other side to have no impact on the runners. Plus the run did not disturb people in a residential area. Except for the turns the route was not tough despite a couple of long, steady gradients. I did 12.6 Km(3 loops) in 1:09 at an average pace of 5:28 per Km. As always in an out and back course of multiple loops one meets familiar runners multiple times which adds to the comraderie and motivation. I was able to pretty much sustain my pace doing the HM(5 loops) in 1:56:28 at an average of 5:30 per Km. However, after that my pace started to drop rapidly as the left glutes and hamstrings started hurting quite a bit. My stomach also ached on and off. The next 11.2Km took me 69 minutes at an average of 6:10 per Km. Overall I completed 32.3Km in 3:06 - about seven minutes slower than target. The last 3-4 Kms was a real struggle and has me quite worried and disappointed. With this kind of running the target of 3:45 in Mumbai looks quite impossible. Not sure what excuses to make for this. I had been on my feet since 7:30PM well before start of the race and had not eaten a proper dinner . Also, for the first time in a long while I did a 25Km+ run without eating a couple of bananas ; on top of that I had forgotten to get an energy bar. 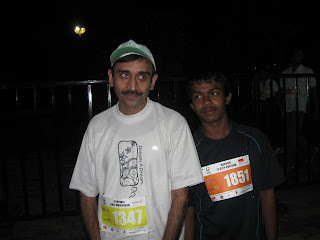 Several runners did very well - Athreya lapped me a couple of times on his way to a FM in his PB time of 3:06 - the first Indian male to complete. Neera was the first Indian woman to complete the FM in 3:52. And Vaishali was the first Indian woman to finish the HM! 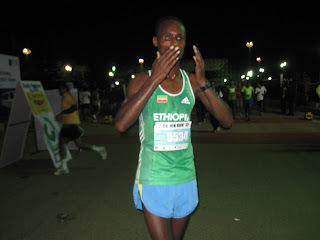 Since the midnight run on 11th December I did my last 30Km run in GKVK on 24rth December. Again I had a fairly comfortable run till about 25Km but had to slow down considerably after that struggling to do 35Km in under 3:15. It is clear that I need to take some time off from long distance running and focus on strengthening my glutes and hamstrings. I definitely intend to do this after SCMM 2012 in Janaury.